El Kraken is no slouch in the power department, but his defense and long stretches without consistent contact have caused some impatience among fans. He has two signature moments in the first-half from walking-off versus Fernando Rodney to making Ken Giles punch himself in the face. Sanchez has been sidelined with a groin injury since late-June and his season grade could sky rocket if he is able to continuous display his power stroke and his .194 BABIP rises. He is still one of the best offensive catchers in baseball and has a cannon of an arm. Romine came back down to earth after a monster start to the season as most predicted he would, but he has still been a savior for the Yankees amidst Gary Sanchez’s injury. Among catchers, his 1.4 bWAR and .825 OPS is second in the American League behind Wilson Ramos. His defensive WAR ranks second to only Salvador Perez of the Royals. The only negative to Romine’s season is how he is not the all-knowing personal catcher for Sonny Gray he was drawn up to be. As a backup catcher, the Yankees cannot ask for anymore from Ro. Bird missed a large portion of the beginning of the season with an aggravation of his ankle injury from a year ago. He’s healthy, for now, and is playing every day which is a huge step in his career. In terms of performance, Bird has seen his ups and downs. He started off very sluggish, battling to stay above the Mendoza line, which saw fans want him sent down or a replacement traded for, but Bird appears to be on the come up. Since June 29, he has posted a .922 OPS. The Yankees have had league-worst production from first base, and a resurgent Greg Bird would be a huge addition to an already potent offense. 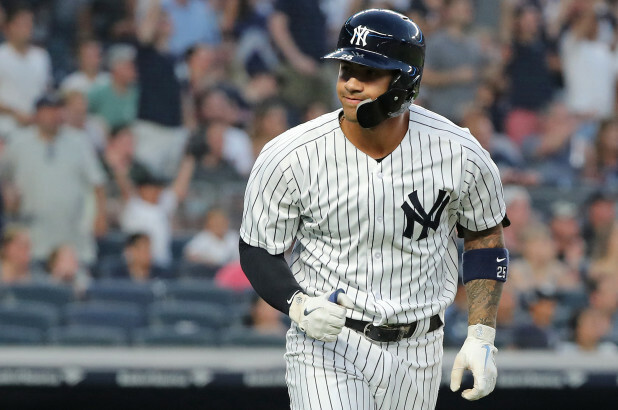 Gleyber Torres has not only exceeded expectations, he has been a sparkplug for this team. The Yankees were barely above .500 when he was called up and are now the second-best team in the sport. He made the All-Star team after missing the season’s first month and is the frontrunner of the AL ROY. He has had his share of miscues in the field (second among AL 2B in errors), but still has above average fielding metrics. He has a .905 OPS and has proven to be a clutch player on a team that can struggle hitting with RISP. His return from his minor hip injury will be a welcomed addition to the lineup. Gregorius was a consensus AL MVP candidate after a historic April, but he had a Chase Headley-like May and saw his numbers drop substantially. He’s returned to his normal performance in June and July and has solid numbers across the board to go along with his defense. 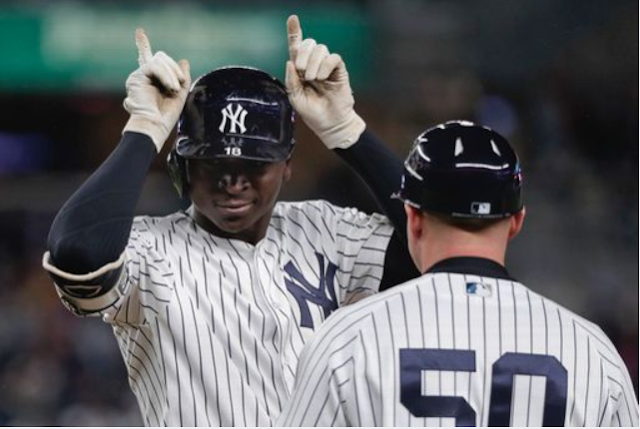 Sir Didi has a 2.7 WAR, a .800 OPS, and is on pace to shatter his career highs in walks and home runs. The other rookie in the Yankees’ infield has been solid on the offensive side of the ball, but has received criticism for his defense. Miggy is sixth in the entire American League in doubles and has a 2.1 offensive WAR, but has a -7.2 UZR and -12 defensive runs. Andujar’s job looked to be in trouble as Machado rumors swirled around the Yankees, but with Machado heading to LA, third base is Andujar’s position for the remainder of the season. 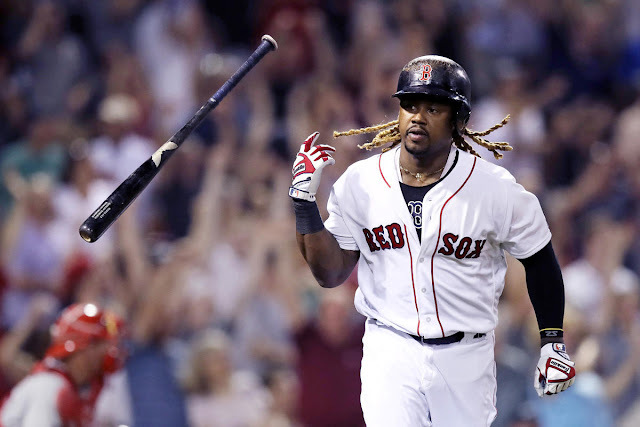 The Yankees would love to see him stay on his current offensive pace, but need him to work on his defense to improve his overall value to the team. Signed as a backup for a young infield, Neil Walker has not been able to adjust to a bench role with the Yankees. In 193 at-bats, Walker has a horrid 54 OPS+ and a -0.8 bWAR. He remains on the Yankees because of his veteran presence and versatility, but could become expendable if the Yankees decide to carry Brandon Drury. Walker only avoids an F because of his cheap contract and the injury insurance he has provided for first and second base. Aaron Judge has rose to the occasion and silenced the critics who said he could not repeat his MVP-caliber season from a year ago. He garnered his second straight All-Star start and has accumulated a 4.7 fWAR. He is well on pace to break the 40-homer, 100-RBI plateau once again this season and continues to post a near .400 OBP. His defense shouldn’t go unnoticed either as he has a 16.5 UZR playing right field. Gardy has had his ups and downs this season, but has respectable numbers across the board. His power numbers are down from a year ago, but he has continued to grind out at-bats and play solid defense in LF and CF. He started the season slow, but has brought his numbers back up to par with his career norms and looks to be on the rise in the second half. His BABIP is at a career-low and his walk rate and strikeout rate are actually better than the marks he posted last season. Aaron Hicks missed some time early in the season with an intercostal strain, but has made the most of his playing time in 2018. He’s arguably been a top-five CF in the majors this season and has the numbers to back it up. He already has his career-high in HR’s with 16 and is second in the American League in WAR among center fielders. He’s been streaky this season and has been exposed by breaking pitches at times, but he continues to make Brian Cashman look like a genius for his acquisition from the Twins. Booed loud and early, Stanton appears to have overcome his early season woes and is giving fans what they expected from the Yankees’ prize offseason acquisition. He just missed out on an All-Star selection via the Final Vote and has a well above average 133 wRC+. His home/road splits still leave a lot to be desired but as the weather has heated up, so has Stanton. He is hitting .349 in July and has 12 home runs since the start of June. Stanton may not replicate his NL MVP from a year ago, but to call him a bust is far from the truth as he is proving to be one of the most potent hitters in the American League. The Yankees’ ace has been stellar this season and is a frontrunner for the AL Cy Young. Severino is 14-2 with a 10.10 K/9 and a miniscule 2.31 ERA. He pitched a scoreless inning in the All-Star Game and is showing no signs of slowing down. He recorded his first career shutout this season and is on pace to break his strikeout total from a year ago. Every time Severino takes the mound there is a different vibe with the team expected to win that game. He has been pivotal for a team that’s rotation has not been its bright spot. The Yankees took a gamble on CC Sabathia after a solid showing in the 2017 regular season and postseason and have been rewarded with their second-best starter. Sabathia has a 3.51 ERA in 100 innings. His numbers may not jump off the page, but he went from a veteran backend starter to the teams go-to guy behind Luis Severino. Sabathia has been an integral part of the team due to Tanaka and Gray’s struggles. Tanaka stumbled into the postseason in 2017, but was electric and a big factor for why the Yankees made it within a game of the World Series. This gave Yankee fans hope he would turn it around in 2018, but that has not been the case as the home run prone Tanaka has returned. He has allowed almost two HR/9 and has a 4.54 ERA. 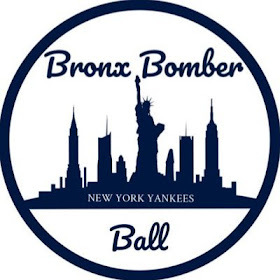 He is two starts removed from a dual-hamstring injury, and Tanaka will be a huge X-factor for if the Yankees win the division or settle for a Wild Card Game. “The Yankees are the best team in baseball four out of every five days.” Right out of Sonny Gray’s mouth came this quote after one of his many horrendous starts in 2018. Gray was tabbed by many to be a dark horse CY Young candidate in his first full season in the Bronx, and they could not have been more wrong. Gray has a 5.46 ERA and a career-worst walk-rate. Gray’s rotation spot does not appear to be in jeopardy, so he needs to figure it out and turn it around or he could cost the Yankees more than a few games. German has been an adequate fill-in for the backend of the Yankees rotation, but his inconsistency has been his downfall. On any given day, German could strikeout ten hitters through seven and look like an ace or not make it out of the second inning with his team down by a multitude of runs. Unfortunately, the latter has happened more often than desirable, so when the Yankees acquire a starter he is likely going to be sent down or moved to the bullpen where his stuff could play well. 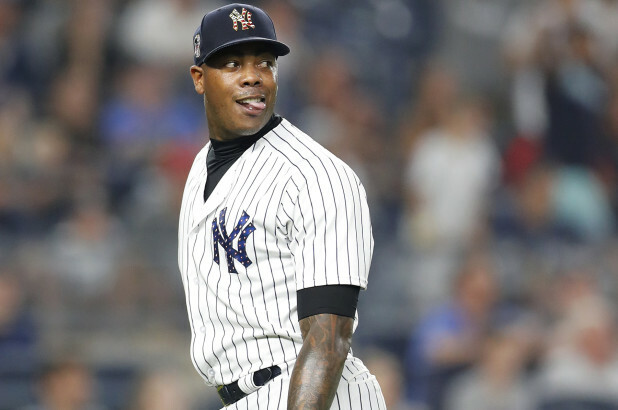 Aroldis Chapman has returned to being an elite closer, earning his first All-Star appearance since joining the Yankees. He has a 1.35 ERA. 15.3 K/9, and 26 saves. He has continued to work in his secondary pitches which have been crucial to his success. He has been battling some knee tendonitis, but it does not appear to be a serious issue. After a rough start to the season, Betances has been virtually unhittable. His 15.68 K/9 is a career-best to go along with a 2.61 ERA. He has allowed only five hits and one earned run since the start of June. An effective Betances is a huge piece for an already filthy bullpen. Robertson has had a few hiccups this season, most notably the Easter grand slam he allowed to Justin Smoak, but has overall been a solid reliever for the Yanks. He has a 3.09 ERA, 10.92 K/9, 0.96 WHIP, and a walk rate that’s better than his career mark. Robertson’s veteran leadership and postseason experience will be crucial to this team in the stretch run. Green has proven his breakout year in 2017 was not a fluke and has continued to devastate hitters again in 2018. Green’s implosion versus Cleveland inflated his ERA to 2.74, but his numbers are phenomenal all-around. He has a 11.15 K/9, 1.76 BB/9, and a .222 BAA. Green’s biggest downfall this season has been the long ball as he has already allowed more this season than all of last season. Warren missed most of May due to injury, but has been extremely effective when he has been healthy. He has a 1.85 ERA, 10.73 K/9, and a .226 BAA. 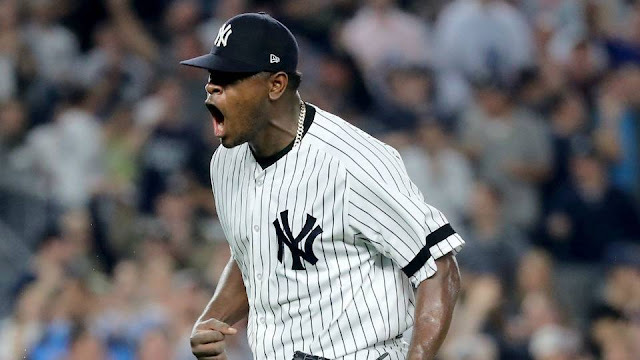 Despite being one of the last relievers in the Yankees’ pecking order, Warren is still having a fantastic season and is proving to have been an awesome “throw-in” in the Aroldis Chapman trade that netted the Yankees Torres and McKinney. No one could have seen this season coming from Holder that he has put together. 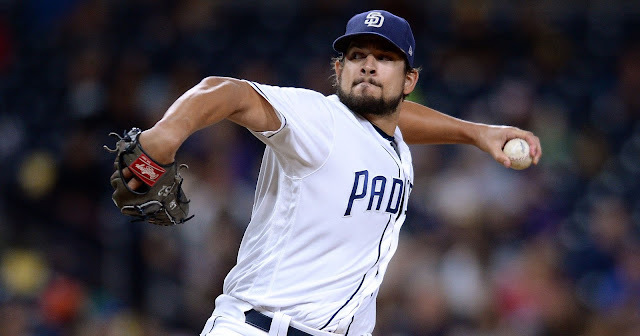 Holder has a 1.85 ERA and has effectively taken over the role Tommy Kahnle held last season as a sixth inning bridge who could go multiple innings if necessary. After losing his spot on the roster in April, Holder has taken his second chance and not looked back. The lone lefty in the pen outside of Aroldis Chapman, Shreve has had a disastrous season. He started off April with a 0.79 ERA. However, this success was not sustainable as he’s allowing home runs at an alarming rate of 2.14 per nine innings and has a BB/9 of 4.54. Shreve’s spot on the roster could be in jeopardy if the Yankees decide to trade for a southpaw.